Laci Stapp’s new book “Benson's Pals - Take a Bite Out of Bullying” is a heartfelt story that exhibits responsible behavior to young readers. 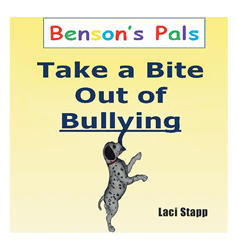 Recent release “Benson's Pals - Take a Bite Out of Bullying” from Page Publishing author Laci Stapp is an entertaining tale that children can engage and relate with, and teaches valuable lessons about handling a bully. Laci Stapp has completed her new book “Benson's Pals - Take a Bite Out of Bullying”: a gripping and potent story for children that demonstrates the proper course of action to take when someone is treating others with cruelty or unkindness. Laci’s book series are Christian-based and depict animals from their rescue to deal with problems children may face every day. “Take a Bite Out of Bullying” is the first in the series. It encourages young readers to seek help immediately if they are being bullied. All the proceeds raised through the Benson’s Pals children’s book series will help animals in need while bringing awareness to many issues. Published by New York City-based Page Publishing, Laci Stapp’s endearing tale follows a dog named Benson through his struggle of being bullied by a bigger, meaner dog named Brutus. Benson must decide on the right way to handle this trying situation. Laci Stapp recounts watching a documentary interview and wondering why a ten-year-old child from a good home with good parents would want to take his own life. Ty Smalley would not be forgotten as his parents started the nonprofit group Stand for the Silent. Laci wanted to use Benson’s Pals to convey a message to young readers about bullying and the importance of reporting it immediately to a responsible adult. Benson’s Pals and Stand for the Silent together want to take a bite out of bullying and put an end to youth suicides. Readers who wish to experience this potent work can purchase“Benson's Pals - Take a Bite Out of Bullying” at bookstores everywhere, or online at the Apple iTunes store, Amazon, Google Play or Barnes and Noble.